Steve Austin, the Bionic Man, and Jaime Sommers, the Bionic Woman, may have been the ones with the special powers, but it was Oscar Goldman who was the man in charge. He was played as an authoritative and friendly man throughout both series by Richard Anderson, a man whose association with the shows has grown since they stopped being made in the early Eighties. He was the one who persuaded American TV to bring back the Bionic pair in a trio of feature-length television specials and now, more than 20 years since he first played Oscar Goldman, he is Executive Producer of a planned multi-million dollar spin-off movie which he hopes will be released next year. It all began in the usual way. He received a call from his agent to ask if he was interested in appearing in a 90 minute pilot film for The Six Million Dollar Man. He accepted, and pretty soon found himself part of a hit show. "It just caught on," he says. "It was electric, it became an institution every Friday night. After the Vietnam debacle, we were the first show that brought back the hero." The premise of the show, as explained by Richard's voice-over in the opening titles, was that former US Airforce pilot Steve Austin was "a man barely alive". He had lost both his legs, an arm and an eye in an horrific plane crash, but was saved by pioneering new tech nology, at the cost of six mil lion dollars. His eye and limbs were replaced with bionic components that gave him super strength, super speed and super sight. Once he learned to accept these pieces of machinery as part of his own body, he became the ultimate special agent, ready to tackle criminals, terrorists and aliens on Oscar Goldman's instructions. The series was an instant success, especially among children, as Richard Anderson soon discovered. "I got a call from my daughters, who were at school, and they said 'Dad, everybody's running around in slow motion'! That's when I thought we might be onto something." Soon, youngsters all over the world were imitating Steve Austin's amazing feats of speed and strength, which were always shown in slow motion and accompanied by a distinctive sound effect. It became the show's trademark and helped it translate across the globe. "This was a visual, high-adventure show which I think is why it became so successful in 60 countries. The dialogue was clear and simple and you could watch it with out needing to know what was being said, as long as you understood the opening." Richard Anderson also believes the show's success stems from what he calls its 'medical message'. It reflected the advances in medical technology at the time, putting across the positive message that "we have the technology" to rebuild a badly injured man. The idea of creating a super man was, of course, a fictional one, but the possibility of replacing arms and legs with working artificial limbs was fast becoming a reality. "The cybernetics was a fascinating thing because it was reasonably new to the public. It didn't take long for the words 'bionics' and 'cybernetics' to become more widely known. After two years of doing the show, there was a man from Boston who lost part of his arm, I believe it was above the elbow. They were able to give him a new arm that functioned using signals and nerve endings, and he could lift 40 pounds." 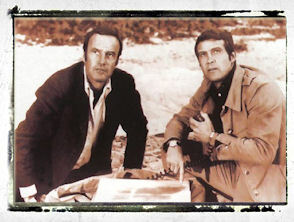 Richard Anderson was already a well-known face on television when he joined the cast of The Six Million Dollar Man. He had been one of the regulars in the short-lived sitcom Mama Rosa as far back as 1950. Also during the 1950s, he was on contract with one of the major Hollywood film studios, MGM, and appeared in around 30 movies, including a supporting role in the 1955 Science Fiction classic Forbidden Planet. In the Sixties he seemed to go from one television series to another, being part of the main cast in Bus Stop, The Lieutenant and then Perry Mason. There were many other movies and guest appearances, plus another regular series in the early Seventies, Dan August, in which he played a police chief alongside Burt Reynolds. When it came to The Six Million Dollar Man, he took on a relatively minor role. He was often only seen at the beginning and the end of an episode, briefing Steve Austin on his mission, but he didn't really mind. "I grew up on the Bond movies and I remember those wonderful inspectors and those fellows in the experimental labs and they'd make an impression with minimal footage. In the Bond movies there are these wonderful characters, one who is always in the labs and another one who sends him out, and I thought, 'If that's the way they want to start, fine'." But Oscar Goldman wasn't stuck in his office for very long. Writers and producers soon realised they were under-using one of their main characters and saw the opportunity to widen the scope of the show. "As time progressed, they needed story- lines. Consequently, they said 'why don't we have Oscar kidnapped?' or something like that. Also, as an actor, you bring in things. That's what actors are supposed to do, they bring in things to fill the words and so forth. When they see this chemistry between the actors and see their own personalities, they start writing for it. So, in time, the part expanded and became much more rounded." The stories also branched off into different areas. Espionage was always at the heart of The Six Million Dollar Man, but the Science Fiction aspect of the show occasionally allowed it to take on more fantastical story-lines. Steve Austin's Airforce background provided a way to take the stories into Space, while the Science Fiction boom in the wake of Star Wars encouraged more stories involving aliens. "I don't think it mattered what we did because so much was there in terms of the players and the concept," Richard reflects. "So when we went into Space, fine. When we did James Bond, that was fine. When we had personal missions, that all worked. If you're asking me which I preferred, I would say I always loved mystery. Mystery allows suspense and when we had those opportunities I thought that was quite intriguing." The first appearance of the Bionic Woman was in a two-part story of The Six Million Dollar Man. It introduced Jaime Sommers as Steve Austin's fiancee who was given a bionic ear, arm and legs following a skydiving accident. Audiences loved the new character, and were appalled when she died. The reaction forced the producers to rethink, and she was brought back - having only been in a coma, it was revealed - and eventually got a series of her own. It heralded the most successful year for both bionic shows, with The Bionic Woman overtaking The Six Million Dollar Man in popularity to become the fifth most watched television show in America that year. It doubled the amount of work for Richard Anderson, of course. He played Oscar Goldman in both shows at the same time. "It was a full time set up and there really wasn't much time to do anything else," he says. "The studio organised me well, they had a driver and a warm car in the winter and air conditioning in the summer. I remember one day I had to pop back and forth four times, and we had pick up scenes we couldn't finish. I had dialogue from three or four different shows in one day!" The two series had the same format, but gradually developed their own distinct tone. Lindsay Wagner's The Bionic Woman tended to be lighter than Lee Majors' The Six Million Dollar Man, and the direction they went in some what reflected their personalities. 'They worked differently, they had different personalities, but basically they both went for the important things," says Richard. "Lee Majors has had an extraordinary television career, the amount of shows he's done - all hits - he understood what he could give to it. Lindsay is an extraordinary actress and has a wide range of private interests and strong beliefs that she wanted to integrate into the show, which I think she did successfully. She wanted to escape the idea of 'just get on with the action' and put some fibre and reality into her problem as a bionic woman, and that's what gave it juice." Lindsay Wagner also strongly believed that childcare should be available in the workplace and, as a mother with a young child, it was something the studio couldn't ignore. "She'd bring her child to the set, and that was what they had to deal with. I think she was the first one who ever did that, effectively saying 'if you want me you have to take what comes with it'. She broke some barriers and I think all the studios today have childcare centres." 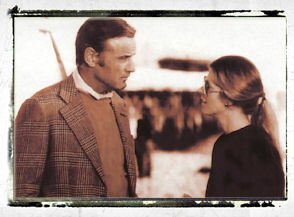 Oscar Goldman stopped sending Jaime Sommers and Steve Austin out on missions in the early Eighties, but by the time the actors went their separate ways, the series had succeeded in raising their profiles. It made producers and casting directors more aware of their existence, and it also made them more recognisable in public. "I've done a lot of travelling since and it's been extraordinary," says Richard. "You're standing at the Great Wall of China and a Chinese man comes up and talks to you! It's been unbelievable. Egypt, up river - anywhere. It's really quite satisfying. It made us all known in a different way than ever before, and from it came a period of other opportunities." Lindsay Wagner's success as the Bionic Woman (she won an Emmy award for her role in 1976) lead her to be cast as the lead in two subsequent drama series, Jessie and A Peaceable Kingdom, while Lee Majors continued to play the action hero in The Fall Guy. 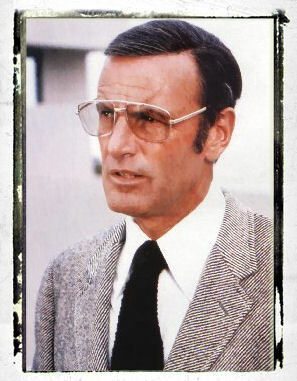 Richard Anderson also had no shortage of offers and soon found himself back in a regular series as an Oscar Goldman-type supervisor for a team of spies in Cover-Up, fol lowed by a season as Senator Buck Fallmont in the celebrated soap opera Dynasty. During this time, he stayed friends with Lee Majors, and it was this friendship that gave him the idea to push for more bionic adventutes. "Majors and I were on a barge trip with some friends in the south of France. One day he went jogging and I got on a bicycle and met him up at a castle. I rode behind him and said 'Steve' and he said 'yeah, what is it Oscar?' I said 'I've got one more mission for you'. We went through the whole number - and that triggered something in me. So I went to the studio and I said 'I think it's time'." The studio agreed that it might be time to bring back the Bionic Man and the Bionic Woman, but they weren't sure their enthusiasm would be shared by the TV network. Richard Anderson then approached the network, and ended up going back and forth between the two organizations like a bionic ambassador, until he got the go-ahead. The result was a two-hour special The Return of the Six Million Dollar Man and Bionic Woman, which he produced and co-starred in. 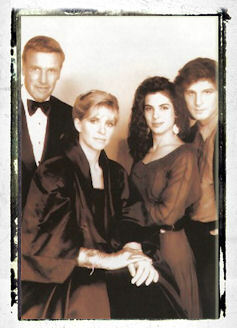 That led to a second film which featured a young Sandra Bullock, playing a new, stronger bionic woman. In the third film, Steve Austin and Jaime Sommers finally acknowledged their love for one another and got married. The telemovies were a success, and proved that there was still life left in the old concept. With that in mind, Richard Anderson went to see Universal Studios. "They thought it had merit and we are now in development to make a hundred million dollar popcorn movie. One hundred million dollars makes the original budget for the television show seem like pocket money - in fact, it's enough to make 16 six-million-dollar men! 'That's in part what's happened to the business," Richard explains. "The big studios here now realise that for them to operate they've got to make 10 or 12 big pictures, and, of them, maybe five will hit big. They saw what I had in mind and put the Bionic movie in that big budget category because it's a franchise. It's a brand name - easy to sell." Being in development is no guarantee that the movie will go into production, but the signs are good. Successes like The Fugitive, The Brady Bunch, Mission: Impossible have proved that audiences are willing to pay to see their old TV favourites writ large on the big screen. High profile director Paul Anderson ("no relation, by the way"), whose credits include the new space movie Event Horizon, is now attached to the project, and if everything goes to plan, the film could be ready for Summer or Christmas next year, depending how long it takes to do the special effects. Whatever casting decisions are made, Richard Anderson is certain that Oscar Goldman will still be in charge, "In the arrangements to executive produce the movie, it's been agreed that I also play the same role that I played in the series." As for the lead role in the film, that will, presumably, be taken on by a new bionic person 'That's a little premature to talk about," the producer muses. "I don't know how they're going to go with that. That's a money decision for the highest echelons of the studio to decide."